Was ist los in Franken? ANSBACH, Germany — Soldiers and Family members of the U.S. Army Garrison Ansbach (USAG Ansbach), the 12th Combat Aviation Brigade (12th CAB), joined by Soldiers of the 1st Air Cavalry Brigade (1 ACB) and 678th Air Defense Artillery Brigade (678th ADA) participated in the Ansbach Clean-Up Day March 17, around USAG Ansbach posts. 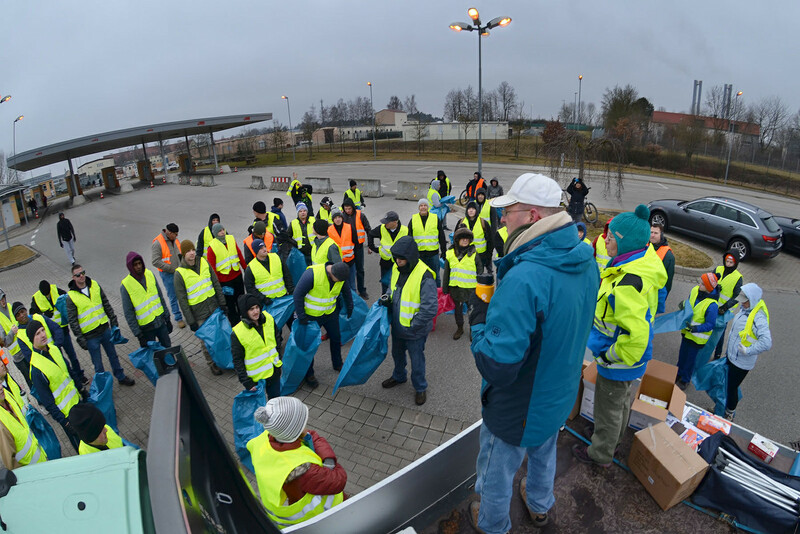 During this year’s event, more than 200 Soldiers, Family members and USAG Ansbach Civilian employees met early Saturday morning at the entrance to Katterbach Kaserne to “pitch-in” and pick up rubbish outside post. The event, Ansbach’s “Cleanup Day”, also known as “Ansbach Saub(ä)er” is organized by the city of Ansbach and held each year. U.S. and German community members take part by donning day-glow safety vests, then take to the streets, roadways, parks and other public spaces around Ansbach, collecting rubbish. Though the morning was cold, grey and dismal and the hour was early, Soldiers and Civilians were in good spirits and made the cleanup march a light-hearted hike, jogging, taking selfies and socializing as they scoured the roadways and parks in the towns they walked through. USAG Ansbach Directorate of Public Works (DPW) supplied the U.S. participants with the reflective safety vests, gloves, trash bags and trash grabbing tools and coordinated groups of Soldiers to clean up designated nearby areas. This year participants cleaned up the immediate vicinity around Katterbach and Bismarck Kasernes, and as far along the roadway and through the towns between Katterbach and the Ansbach city limits. Groups of Soldiers also worked to clean up the public areas outside Barton Barracks and Bleidorn Kaserne as well. Also participating were German organizations such as the local Deutscher Alpenverein Ansbach (German Alpen Club Ansbach), employees and friends of the nearby Fire Station Hennenbach, members of the Technisches Hilfswerk (Ortsverband Ansbach) as well as assorted local German youth clubs. USAG Ansbach Commander, Col. Benjamin Jones, who turned out early Saturday to participate in the cleanup accompanied by his wife and two young sons, was gratified at the large turn-out of U.S. personnel. Later in the day the city of Ansbach arranged and sponsored a free catered hot lunch for all participants at the Eyb Distlersaal (community center) where many attending Soldiers enjoyed Franconian specialties and spoke with some of the citizens whose towns, parks and sidewalks they had together helped to clean up. The U.S. Army Garrison Ansbach (USAG Ansbach) Military Community is located in the Franconian region of Bavaria and is spread across six sites and nine kasernes dispersed around the city of Ansbach and the village of Illesheim: Barton Barracks, Bismarck Kaserne, Bleidorn Kaserne, Franken Kaserne, Katterbach Kaserne, Oberdachstetten Training Area, Shipton Kaserne, Storck Barracks, and Urlas Kaserne. Today, Ansbach is the home of the 12th Combat Aviation Brigade (12th CAB), the community’s largest tenant unit. 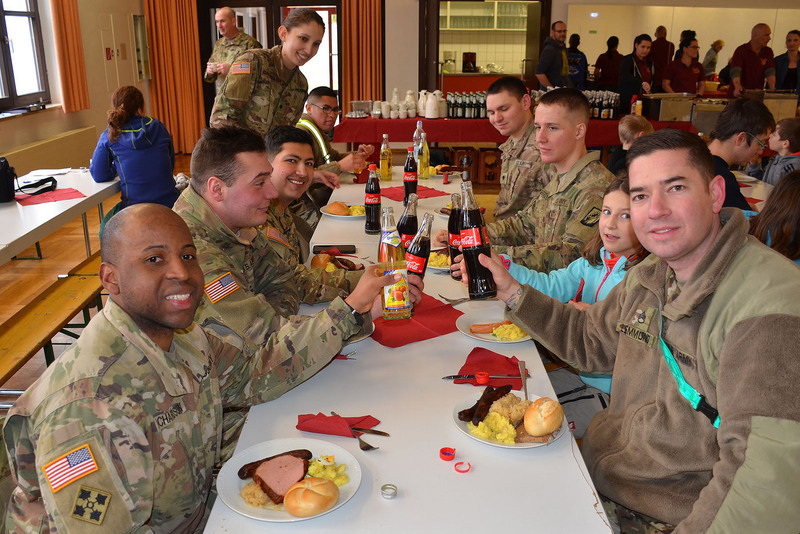 The garrison takes pride in its support to more than 6,000 Soldiers, civilians, and family members, working and living within the USAG Ansbach area. Copyright © 2019 Ansbach Hometown Herald. All Rights Reserved.